Glogirly, Waffles and I want to wish all the daddy's out there a very Happy Father's Day. 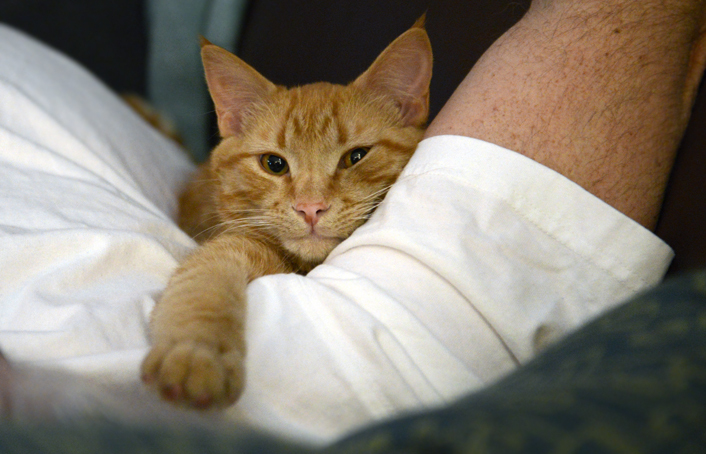 Whether you are a fur-daddy, a people-daddy, a friend, mentor or teacher... we honor all of the "daddy's" that have touched our lives, protected our hearts and told us that everything is going to be ok.
WAFFLES: Happy Catdaddy Day, Gloman. Us men gotta stick together. "You're little one misses you. So very, very much." Happy Dad's day to Gloman. And we know what is to miss a dad-the woman was just reading another post on someone's dad and started missing hers. Happy Father's Day to your human dad! Purrs! Happy Farthers' Day to your daddy. Have a serene Sunday. Happy Daddy's Day to Gloman! Remember the sweet memories Glogirly! Happy Father's Day to your dad!! Happy Cat Daddy and Father's Day. Nice to see Gloman getting lots of love from Katie and Waffles! Such wonderful photos - Happy Father's Day to Gloman, and hugs to you as you remember your dad. Happy Cat Daddy Day to Gloman. We hope that Katie and Waffles spoil him with all of the love he deserves. Glogirly's post to her daddy brought tears to my eyes. Love eternal. Happy Cat Daddy Day to Gloman and to OUR Cat Daddy, and a virtual hg to Glogirly, missing her Dad. 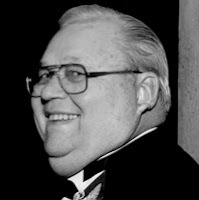 Our Mom's Dad is also no longer here, but we hope he is watching his children grandchildren uand great grandchildren. We both Daddy's girls, Katie. Happy Pop's Day to Gloman. Happy Father's Day to Gloman and all the dads everywhere. Awww those pictures are so sweet. Happy Father's Day Gloman! Happy Father's Day to Gloman, and purrs to Glogirly and her fond memories of her own dad today. Happy Father's Day to your Gloman Daddy and to wonderful Fathers everywhere! Love how Katie loved her Glodaddy. It's so sweet. Waffles Too has the cutest face ever, he plays the foil to Katie perfectly. Happy Father's Day Gloman...you have 2 very special fur babies! And Glogirly, your words about your dad brought tears to my eyes...cherish your memories. Happy Fathers Day to Gloman! That is so cool Katie! Happy Father's Day to Glow Daddy! 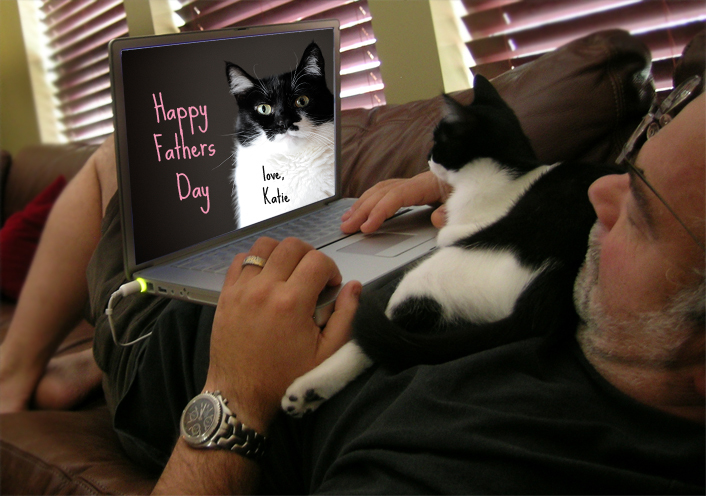 Happy Father's Day, and Happy Cat Daddy's Day, dear friends. Aw, Gloman is a good Dad to Katie and Waffles ;-) They all look reallll comfertables! The Human says she had a fantastic dad and she misses him lots...she thinks he might be hanging out having a cold one with the other Dads "up there" & watching the Giants. Happy Father's Day to all the dads! We love the pic of Waffles with Gloman, how very sweet! Hope you all had a wonderful Father's Day! We hope Gloman had a purrfect Father's Day.